Last week my military schoolhouse was shutdown for summer exodus. During that time we had the opportunity to take a trip to Pittsburgh to visit my parents, grandma, and other relatives. Here are some pictures of the trip. Elijah, Grandma, and Pap at Gus’ Icee Ball stand (been there since the 30’s). 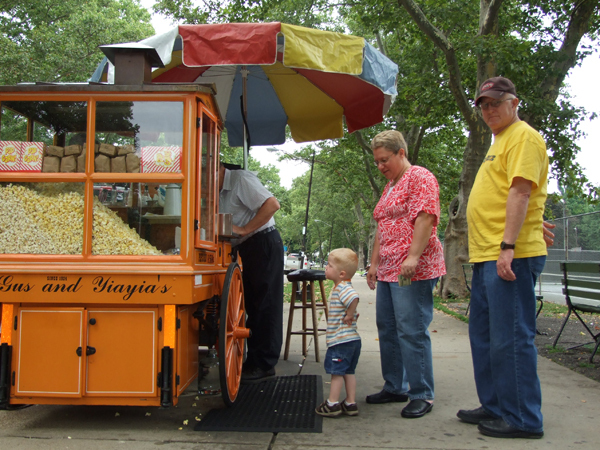 They have the best popcorn, peanuts, and old fashioned hand-shaved icees on the planet. Notice Elijah and Pap both with one hand behind their backs. Apparently I used to do that too. Adina says I still do. Elijah “preaching” in Pap’s church. We pray that his fiery, sweet disposition may be channeled into service for our Lord. Pap loved seeing his little Spurgeon in the pulpit. The family, with Pittsburgh in the background. 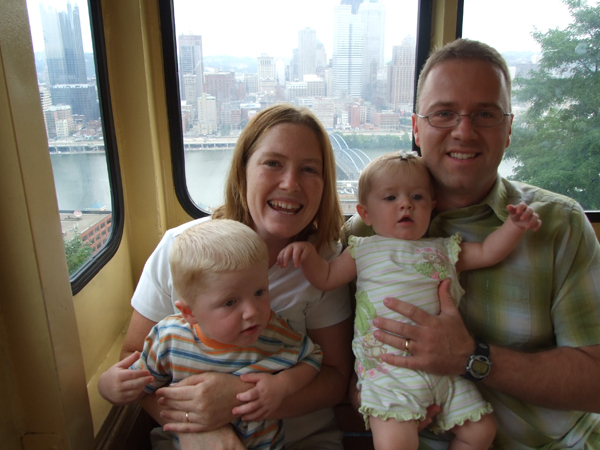 We’re riding the incline, a trolley that goes up and down the side of Mount Washington. 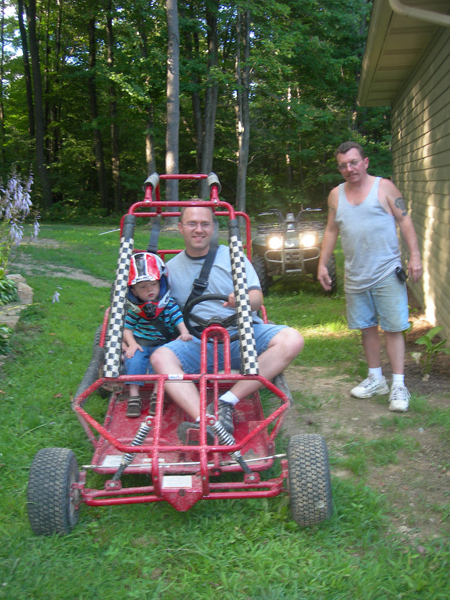 Daddy and Elijah go for a go-cart ride at Great Uncle Joe’s house. Elijah loved the ride. We went up and down Uncle Joe’s dirt road a few times. 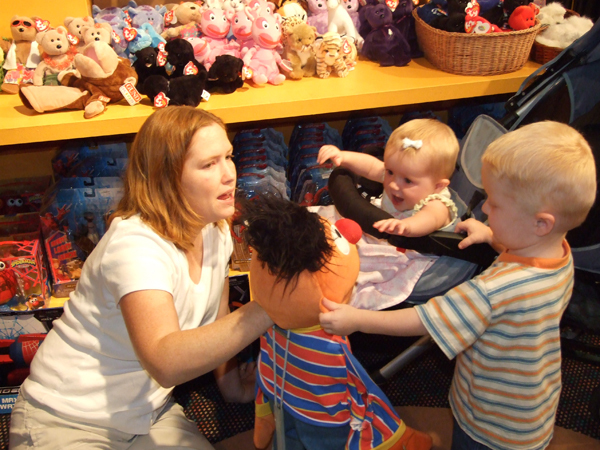 Merry and Elijah enjoy an Ernie puppet at a Pittsburgh toy store. Merry particularly enjoyed Ernie and did her 7 month old best to interact with him. It’s such a joy to watch her grow. Sorry for the long delay in a post. . . we are now in Pittsburgh for the week visiting Jeremy’s parents, grandmother and other relatives while Jeremy has his summer “exodus” from school. It has been so good to spend time with Jeremy for more than two days in a row! We will post pictures as soon as we can get on this blog with the right computer. We will return to the DC area later this week and spend Jeremy’s 29th birthday with him (Tuesday the 31st) then head out to North Carolina to visit Merry and Elijah’s first baby cousin on my side of the family (see below) and two of their other cousins on Jeremy’s side. Hopefully we will spend a week in NC and return to the DC area to spend one last weekend before seeing Jeremy graduate and head back home!!! Yeah!! We hope to be home by the 17th or so of August. God has been so very good to us! Lumina Joy Cryer was born to my sister Roseann and her husband Joshua last friday around ONE AM!!! What a time to arrive! She is a beautiful sweet baby and is healthy and strong! We praise God for her safe arrival and my sister’s good health in delivering her! Anyway, I can’t wait to see her! Updates on the children: Elijah is saying more and more getting taller. He now sings “Twinkle Twinkle Little Star” (translated by mommy of course!) and prays (translation also provided by mommy as well!) His favorite foods now reflect our beautiful summer diet: french fries, “meat” candy, ice cream, cookies, juice (anything other than water or milk) hot dogs (can be the actual item or brats, breakfast sausage or any other round shaped meat!) Merry is ALMOST crawling – getting around everywhere, doing raspberries constantly and cut her first tooth yesterday. She is eating solid foods three times a day and her diet is beginning to vary considerably! Jeremy’s grandmother is calling me a gypsy because of our vagabond lifestyle this summer, and we laugh. . . because she’s right! I have loved spending time with my children and my husband, sharing Jesus with more than just those in my “holy huddle,” learning to enjoy the feeling of not having roots here on earth. I had no idea when we started out on this adventure that this would be where I would end up. Five previews later the movie started and I loaded his tray with popcorn, tortillas, and sippy cup. 1 hour and 30 minutes later he was still eating, quietly enjoying the movie. He loved the rats, or mouse, as he calls them and was thoroughly entertained – even clapping at some points. I was impressed. My two year old sat through a whole movie. The last 15 minutes of the movie he got a little restless saying he was all done, asking for mommy, and tossing a few pieces of popcorn onto the floor. His behavior was still pretty good and more importantly he was pretty quiet. We were in the home stretch and I felt like we made it. I gave him a wet wipe to clean his hands and the remainder of the popcorn to eat. He thankfully regained his interest for the last 10 minutes or so, after only a 5 to 10 minute stint of disinterest and being ready to go. The credits rolled, he clapped and cheered, and I got him out of his chair. As I gathered up his chair, cup, and bag, my little man made his way down the stairs for the exit. At my instruction he waited for me at the bottom. I was so proud of my little man. For a movie buff like myself, this experience was like a rite of passage, a bar-mitzvah of sorts. We walked out together hand in hand, talking about our experience, with me praising him all the way. When we got out to the car we greeted Adina and Merry with wide smiles, as if we had just accomplished something grand. It’s nice to find a movie that can entertain both a 29 and 2 year old. Ratatouille was thoroughly enjoyable, well written and produced. It’s getting rave reviews. We’ll have to buy it. Check it out if you get the chance. 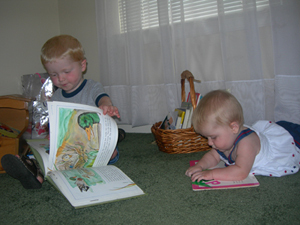 Here is a picture of our latest favorite activity: reading library books. I haven’t made it a consistent part of our family schedule when we are home, but have plenty of time here to! I’m never going back! Elijah loves the same books over and over and I am tired of expending so much energy trying not to throw up every time he brings me his favorite book or two at home. Now with library books, when I get tired of a book we make a trip to the library and trade it in (along with the rest we checked out) and he comes up with a new favorite for the week. I’m not as far along as I should be – I’ve just finished chapter five (that was a long one!) and have started chapter six. If you haven’t done chapter five yet, I think you could do it in two weeks (that’s how long I’ve taken – doing it more in depth) and get more out of it. I have tried to examine my life and my children’s lives along side the study of the wise, fool, mocker and simple. I am interested in all your responses to the question on page 64 (Summary: If I am wise and righteous, can I expect only good (and no trouble) in life?) Please call me when you all meet and end up discussing that, or share your responses here in the comments. I am a bit homesick lately. Tomorrow Jeremy will be 2/3 the way through and we will only have about two weeks left in this house and two weeks of visiting family – one up in Pittsburgh and one down in North Carolina, but I wish we could all get together this week sometime!! I almost cry sometimes when I get up in the morning and ask Elijah what he would like to do today and he mentions one of your children’s names. He has no idea that more than anything I would like him to be able to play with “Sid or Iia” or “Ha-uh” or “Ba-auh and Mo-ee”! HOWEVER. . . I am so grateful that God has given us the opportunity to be so close to Jeremy. 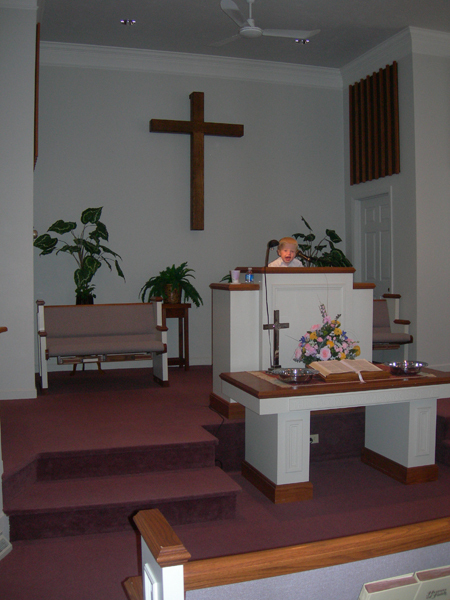 We have had good bible teaching here at the church we used to go to in Maryland (see Jeremy’s blog) and there has been much for us to do. We have visited Baltimore, Alexandria and Annapolis in addition to DC a few times. We cannot wait to see you all and enjoy the laid-back warmth of the Midwest. Please give hugs to your children from us and remind them that we still exist and can’t wait to see them soon! Now that he is officially two years old, he has started insisting on doing things HIMSELF and we laugh at some of the phrases that are coming out “I shut dooooor” “I go libilly” (I’m going to the library – after he has put his own shoes on) “I ge Mimi” (I’ll get Mimi) and most recently telling Merry to “obee” (obey) when she’s doing something he thinks she shouldn’t do including touching one of his toys. Merry is “talking” lots including “mamama” and “bababa” and making raspberries. She also likes to splash in the bathtub, which of course invites the two-year-old-boss-brother to correct this behavior. She has really started interacting with Elijah and laughs when she sees him, lets him read to her and is entertained by his playing of his plastic kazoo. She is really starting to be a little girl – her voice is so pretty, light, high and sweet when she talks. Independence Day! Family Visit! New Words! Potty Training? Happy Fourth of July everyone! We got up early and drove down to the DC Metro rail and took the train into DC and then over to Alexandria, Virginia. Alexandria is a pretty, old town with lots of shops and bricked streets, located on the Potomac, south of DC. We got to peek our heads into the law office that Adina used to work at. The business is no longer there, but it was neat to see where Adina spent 40 hours a week for about a year. We got some ice cream, candy, ate at a chili restaurant, fed some more ducks (I think we’ve now fed nearly every duck in the greater DC area), saw a ton of dogs (which Elijah enjoyed), and got in at least a couple miles of walking. Merry slept most of the way. We were home by 1:30 for naps. I took a three hour one myself – must have needed it. Adina and the kids dropped me off at the normal time after we played with some sparklers with Elijah and Merry. I had the opportunity of enjoying a professional fireworks show right here on Fort Meade from my bedroom. While everyone else is driving home from the show, I am composing this, listening to Bach’s cello suites. What a treat to celebrate our countries independence through the personal freedom of seeing it from your own bed! This past weekend we also had the opportunity of having my parents visit us. My brother Joe was here also, having recently come back from a two year assignment in Okinawa. He stayed the weekend and the kids thoroughly enjoyed grandparents and “Joooe.” He’s heading to his new assignment in his new Ford Mustang. He’s being assigned to Camp Lejune, NC, where my brother Josh and his family are also stationed. He said that it was cool to see 4 of his nieces and nephews all in one day after being gone 2 years. Since I saw Adina and the kids on the weekend Merry has been talking! She says “Ma ma ma.” Whether or not she’s associating it with Adina, herself (Me Me), or just randomly, we light up to hear her say it. She’s growing up so fast. I can’t wait for this school to end so that I can see them every night. In other news Elijah has taken it upon himself to start potty training. We were thinking of waiting until we settled into our new assignment before starting. With all of the changes and road trips we thought it might be a little confusing to start now. But far be it from us getting in the way of progress – he’s doing it (and both types too)! It’s actually quite interesting to see him do it. He doesn’t require any help, getting on all by himself, he faces the rear of the toilet and holds on. Hopefully I’m not being too graphic. Rest assured there will not be pictures published of this! I’m proud of that little guy.